Dave bounced back today. After a couple of lost months he showed up at PMQs and gave a thoroughly convincing display. Shrewd tactics, sound principles, headline-friendly quotes and some decent gags. The Chilcot Inquiry is proving a handy prosecution witness in the case against Brown. Cameron quoted a fistful of top generals who believe the former chancellor was a serial under-funder of the military. Brown’s response was a classic example of bluster and confusion. Good arguments arrive singly. Bad arguments enter in rowdy swarms. He gave five different replies to the main charge: the 2002 defence review had been the best in 20 years; fourteen billion pounds has been spent on Iraq: the rising defence budget would rise even further; the Tory manifesto in 2005 promised a £1.5bn defence cut; the last Tory government cut defence by 30 percent. None of these will answer the key point that he failed to pay for the right kit. Brown even tried striking a note of self-righteousness. Discussing the defence budget, he suggested was unfair and might be demoralising to the troops. Maybe. But not as demoralising as going over the top equipped with Bacofoil body-armour and a pop-gun. Brown is extremely vulnerable here, he knows it, and hasn’t yet worked out how to defend himself. Cameron then turned to lighter matters and wondered why the Labour party had developed a sudden crush on proportional representation. He quoted the memoirs of Paddy Ashdown which, for the first time in their history, were the cause of audible merriment. Ashdown fingered Brown as the chief obstacle to PR. ‘Time after time’ quoted Cameron, ‘Tony Blair would say, “Yeah, Paddy, I agree but I can’t get it past Gordon.”’ When Brown heard this he wasn’t sure whether to laugh or blow his top. So imagine what he did instead. He ignored the question, changed the subject and indulged in a shameless conflation of alien concepts in pursuit of cheap political point-scoring. While Labour supported the alternative vote, he said, the Tories wanted ‘the hereditary vote’. Cameron responded gamely. ‘I don’t know whether he pulled the secretary out of the chair before he typed that one, but it’s a lot of rubbish. There’s only one leader in this house who inherited his title …’ Even Labour’s front bench were caught laughing at this. His confidence comes not just from the latest opinion polls but from his awareness that his election strategy is better developed and more tightly focused than the Conservatives’. Time and again he hammered away at three main points. 1) The Tories are in disarray. 2) They pretend to have changed but they remain the same. 3) They will govern only for the rich. This may not be a winning game-plan but it panders to widespread prejudices about the Conservatives. 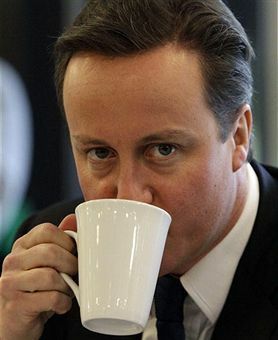 And though Cameron gave the PM a thorough pasting today, Brown’s refusal to curl up and die will cause him some concern.